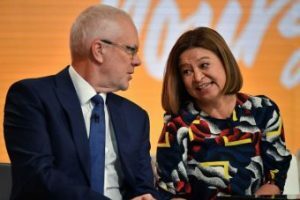 The newly-formed ABC Alumni group, which is made up of more than a hundred former ABC staff (many of them high profile), has called on the government not to make any appointment for ABC Board Chairperson until AFTER a Senate inquiry into the matter is finalised. It’s an effort to try to convince the government not to make any political appointments ahead of the Federal Election and the conclusion of the inquiry. The Federal Government must not rush to appoint a new ABC Chair, especially one who has displayed bias against the national broadcaster’s comprehensive role in Australian society. ABC Alumni, representing more than 200 former ABC staff, appeals to the Federal Government to respect the independence of the ABC and not appoint a new Chair until after the Senate Inquiry into ‘allegations of political interference’ delivers its report in a few months’ time. The current process of selecting and appointing board members is open to political influence and needs urgent reform. The Communications Minister should not appoint ABC board members without complying with the current nomination process; nor should the Prime Minister make a “captain’s pick” for Chair. The leadership of the ABC and the long-term future of the national broadcaster is too important for the Government to rush a decision to appoint a Chair. MAJOR WIN FOR THE ABC! NO THREAT TO DIGITAL!